, Students with Disabilities and Zawadi Scholarships. The retreat, which was held in the Google Zurich office, saw Computer Science students from across Europe, the Middle East and Africa come together to learn from some of the best minds in the industry and each other. What was the highlight of the retreat for you? Penlope: The office tour. It gave me an insight into what a typical Google work area looks like. Every corner, corridor and workspace was unique, different and exciting. I would certainly like to work there! Toby: Unquestionably the chance to meet so many amazing people from all over the EMEA region. It was refreshing to see such a large and diverse group who all had one thing in common - passion for computers and technology. Adriana: Definitely the panel session about Women in Computing, where the panelists addressed a variety of concerns regarding career challenges and balancing work and life (especially with children). The socials weren't bad either, we definitely had fun! The theme this year was “Going Beyond Your Limits”. What tools did you gain from the retreat that will help you to go beyond your limits in the future? Penlope: I learned a lot from the female engineers in the ‘Women in computing’ session about how to make it in a male-dominated industry. I also received invaluable advice and tips from experienced recruiters and interviewers at Google about the hiring process, which will help me to better prepare for an interview in the future. Toby: A key insight I learned was that there are no such thing as limits - until you try something, you can't possibly know if you will succeed. One of the most positive aspects of receiving the scholarship and attending the retreat has been my realization that having a disability is not a barrier to being successful in computer science. Adriana: I had the opportunity to practice a range of skills in a very short time such as poster presentation, Android programming, product management and communication/leadership skills. I’ve also gained a lot more confidence. What impact has the scholarship had on you and your academic career? Penlope: This scholarship has boosted my confidence tenfold! I suddenly feel capable of taking on new challenges both academically and socially. The scholarship also opened my eyes to the number of possibilities available to computer scientists. Toby: It allows me to devote more time to my research and to spend less time worrying about money. It also gave me a renewed confidence in my own academic abilities, even if I did feel somewhat humbled by the achievements of many of my fellow scholars. Adriana: Even as a finalist, it was a great encouragement to be selected from over 1100 applicants. 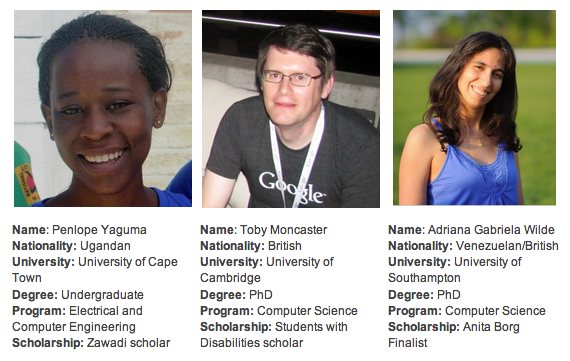 I have been inspired by fellow finalists and scholars as well as Googlers. What advice would you give to someone considering applying for the scholarship next year? Penlope: Absolutely go ahead and apply! You do NOT want to miss this experience. Toby: Go for it, after all, what can you lose? Too many people assume that they simply aren't good enough to apply for things like this and consequently put off doing it for fear of rejection. Adriana: Everything counts. It’s not only your academic merits (which are still very important!) but also your community involvement and leadership potential. If your application can showcase concrete examples of these three areas, you stand a great chance of being selected. Applications for EMEA 2014 scholarships will reopen in the fall. For more updates please follow us on the Google Students Blog. Google recently hosted the annual Scholarships Retreat for over 75 scholars and finalists from the Anita Borg, Students with Disabilities and Zawadi Scholarships. 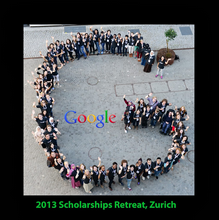 The retreat, which was held in the Google Zurich office, saw Computer Science students from across Europe, the Middle East and Africa come together to learn from some of the best minds in the industry and each other.